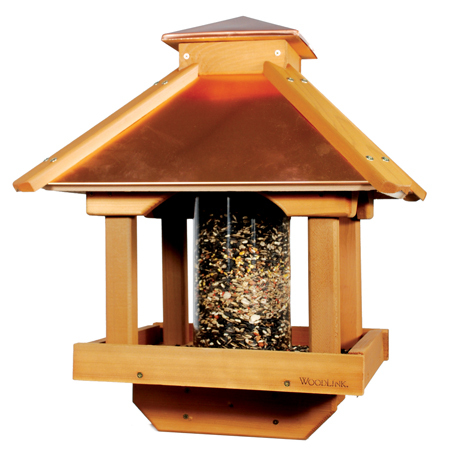 The Woodlink coppertop "original wood" Gazebo Fly Thru Bird feeder is back in production by popular demand! This fly thru coppertop gazebo is back in wood by popular demand. This is a large wooden gazebo bird feeder that will make a great focal point in your backyard. A Whopping 10 LBS. Capacity! NEWS:The Woodlink Coppertop "original wood" Gazebo Bird feeder is extra large and is now back in production by popular demand! One of the best quality and best looking bird feeders out there. BEST PRICE and FREE SHIPPING TO YOUR DOOR!